The lady of the house has a hugely deserved day off as she's 43 years young today!!! By way of celebration the entire family have decided to put 43 facts about Mummy/Janie that best describe her. The picture is my favourite taken 18 months ago. 1. Janie has lived with and blessed me for more than half her life - we met when she was 20yrs old. 2. She is never far from exploding into raucous laughter which fills the house with her warmth and fun. 3. Janie has the cutest tiny hands & feet (size 3 no less) that were ever created - which fit perfectly into mine - the hands I mean! 4. 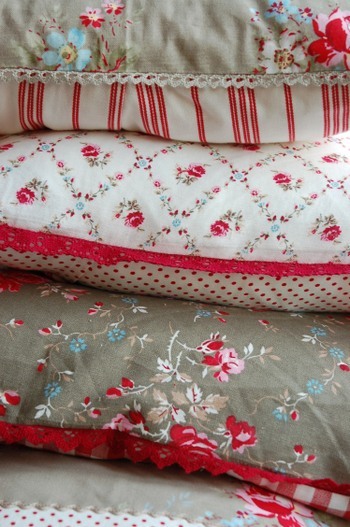 To describe Janie as passionate about her crafts, home, music & fabrics would be like describing Cath Kidston as someone who quite likes floral things! 5. She is the most thoughtful person I have ever met. Who else would remember to buy Alfie an advent calendar for his first Christmas? 6. Personal career over professional career every time. Jane is the most precious & loving wife, and wonderfully nurturing mother to our three wonderfully made children. 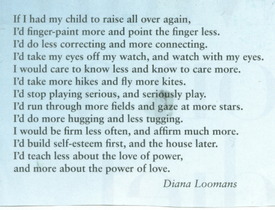 This will always show up the likes of Bill Gates and Richard Branson when defining the true meaning of success. 7. Opinionated and argumentative? You bet. Never have a half baked idea or controversial view without being prepared to defend the indefensible - particularly when it was me that broke the latest Greengate glass or highly treasured plate - lovingly & carefully purchased from a local charity shop. 8. Janie's favourite thing in the whole world is to 'buggle' in - sometimes shortened to 'bug in'. 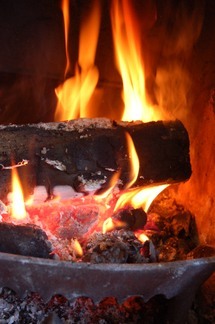 This is when she draws the curtains, lights the fire (ultimate favourite thing to do) puts her oil in the light-bulb ring and snuggles down on the sofa - always sewing or sticking in her 'inspiration books'. 9. A word in edge-ways... umm ..something that must be diligently and expertly worked at if you wish to have a chance to break into Janie's deliberations, observations and reflections on the world going by. Mummy, a kind, lovely mother to have! 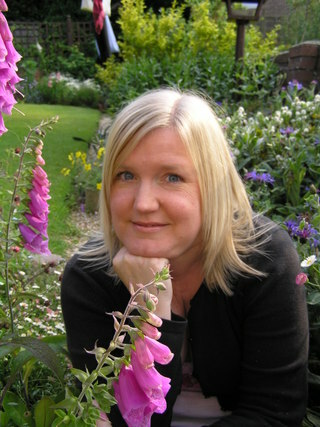 Me, being Alice, the youngest in the house, I think I know nearly every detail of her life! We all want to make this Birthday special. Nearly as special as she is. 11. She is truly attached to her blog and to the computer. Who else would kick us off every time we have just come to the computer! 12. I have never met or known anyone as obsessed as Mummy is with Chris Martin! Only last Sunday Mummy, Daddy and I went into Marks and Spencer's to have a look around. As we walked past the radios 'Yellow' by Coldplay suddenly came on, and of course she clutched the radio and turned it up so loudly, singing along that people were turning around staring! Daddy and I walked off in embarrassment acting like we didn't know this crazy women!!! 13. Mummy likes to have a laugh. That's why she loves Jonathon Ross, Ricky Gervais, Little Britain & Trigger Happy TV! But she really enjoys telling funny stories and listening to them as well. 14. I've got to tell you that not only is she obsessed with Chris Martin; she is also completely obsessed with Persian cats! Of course that is why we have Posy and Alfie. But I couldn't be happier with the type of cats we have because although they have squashed in faces; they're still a delight to have in our small family and makes it all the merrier! 15. Well what else can I say? Oh yes,manners. In this house Mummy goes over the top about them! Throughout my life she has and still is teaching manners and how to be polite and considerate! But at least now we know how to act when we have guests in the house. 16. Just this second she has come in wanting me to make her a cup of tea! I'm not sure if she's told you about this yet; but she wants me to make her tea nearly five times a day. 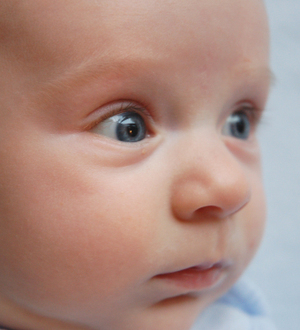 Which now I know what's coming when Mummy calls my love name 'Tiny'. 17. As I have just said Mummy has a problem with calling everyone (as she calls it) love names for nearly everybody she is close to! For example- Tom- Prince munna, Lucy- Doodle, Me Alice- Tiny, Daddy- Button, Uncle Matthew (one of her brothers)- Baby He, Steven (one of her other Brothers)- Stinky, William (Her 3rd and final brother)- Wilfie, Granny (her mum)- My Beau, and Poppa- Red or Wib. 18. Mummy also adores Christmas ( but i can't blame her, because Christmas is lovely!) She loves it so much that she decided to play Christmas music in the middle of August! And as Daddy has again said about, she has brought little Alfie the newest member of the family an Advent calender. Bless! 19. She adores listening to her music and reading house magazines. 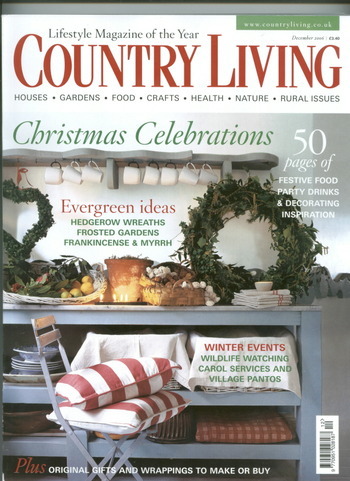 Our house is filled with magazines and books about 'country style' but we don't live in the country. 20. I'm nearly running out with things to say so I'll have to pass the keyboard to Lucy now. But there is one final thing I do want to talk about. She is just GREAT and sometimes i don't realize how lucky I am to have such a wonderful mum as she is!I know that now I'm growing up; she'll always be there to support me through my life now and to come!!! I love you so much Mummy, i can't wait to see you smiling, enjoying your day! 21. Sometimes i wake up at about four or five in the morning and see her light still on, so when i go to turn it off ,i find her sitting up asleep with a book fallen by her side! Every night without fail, she goes to bed with an ice lolly and a hot water bottle...even in summer! Crunchie's, Walkers Baked crisps, Fanta Fruit Twist (even my friends have begun to notice her obsession with it) and Lindor chocolates. 24. Sometimes, she drives all the way to the cinema just to buy popcorn to eat at home...by herself! 25. She has lived in Paris, New Zealand, Scotland and of course England. 26. She is a noisy sleeper, I often hear her snoring in bed at 1.00 or 2.00 in the morning. 28. She is very opinionated over her and other peoples taste in music, it can be annoying but I tend to go along with whatever she says to avoid an argument, but on the other hand she likes some great stuff! 29. She loves reading and watching REALLY depressing non fiction books and television programmes. 30. She would love to be a midwife or an undertaker as she finds these jobs "fasinating". 32. She loves a wide selection of television programmes from the cheesy predictable depths of "the Waltons" "Midsummer Murders" and "Heartbeat" to the decent and thrilling "24". 33. She randomly whistles on a regular basis claiming it is a "love whistle". 34. She hates most sports, particularly football, claming that she "can't bear" the noise of the fans, particularly the drums. 35. She has recently developed a love of doing sudoku and crosswords. 36. She hates cooking with a passion, saying that there is better things to do than spend hours making something which is then gone in minutes. 37. She claims that she would love to live in a retirement home so she can sit around chatting all day, doing crafts and drinking tea with a blanket over her knees. 38. She calls Lucy a "traitor" if she listens to anything other than Coldplay. 40. She tries to remember to take her camera everywhere in attempt to get a good photo for her blog. 41. Like most women she HATES spiders and claims their hairy legs make her "retch". 42. She also HATES sand and claims the feeling of sand between her toes makes her feel ill.
43. She (like her mother) jumps at anything, even if somebody she knows walks slowly through the door. There, 43 things about the woman we love. HAPPY BIRTHDAY. I've been a little pre-occupied of late and here's the reason why... I've got an ipod! 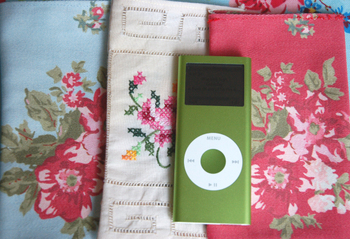 A lovely green ipod. Sigh. Now I've been wondering for about a year if I should get one but as most of the family want one - or should I say need one - my want was not a priority. I had decided 18 months ago that I wanted something else more (all will be revealed on my birthday on Tuesday!) and was putting my hopes into getting that. Well, I have got that for my birthday (yay, it's sitting in my wardrobe, waiting..) and as I was buying Anth one for Christmas (yes, he knows as he chose it) I threw caution to the wind (not like me when anything costs over £20!) and bought one for me as well, over the internet. I had decided to keep it for Christmas but when it arrived it came in a see-through package (once I had open the outer parcel) so the surprise of never having seen a green one was dashed. It sat on my table for a while and I enjoyed looking at it, until last Sunday when I decided I should get a head start with putting my 27 made up CDs of favourite songs - plus all my regular CDs on it. This has taken me all week and I still haven't finished...but I am so pleased that I have started now and not have waited, as Christmas is a busy time for our computer. I have even made 3 little bags from samples of fabric to carry it around in! Sorry the quality of the photo is not very good. 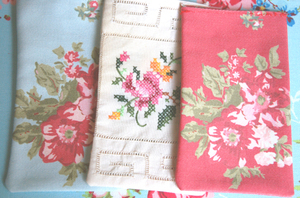 The middle one was a old tray cloth and the 2 others were from Elanbach a company run by Bernard Ashley (the late Laura's husband). My ipod nano is so small it's hard to believe it can store so much and the sound quality is fantastic. So, Christmas has come a little early for me, but you want hear me complaining! Wednesday 22nd November 2006 at 8.33 am. How blessed am I to have this as my route to school in the morning? It never fails to delight me and when the children came (sob) in the car with me, I would tell them what lucky children they were to be surrounded by such beauty and that then would start me off, much to their annoyance, trying to test their knowledge on the wild flowers that were growing in the hedgerow etc. Well, I do think that's important! But... they say that the camera never lies - and yes, they would be right in some ways. But this camera can be misleading and that is something I have not wanted my blog to be. 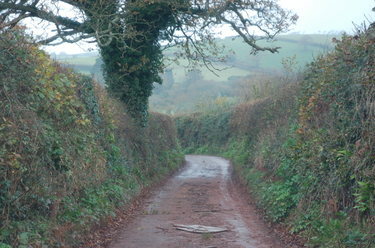 Yes, I could choose to drive 'the lanes way' every morning but although it is extremely beautiful - just over the left side of the hedge in the above picture there is a housing estate and the narrow lane is often littered with glass, discarded appliances and goodness knows what. This has meant that sometimes we have had to pay £50 for a new tyre. Not so good. 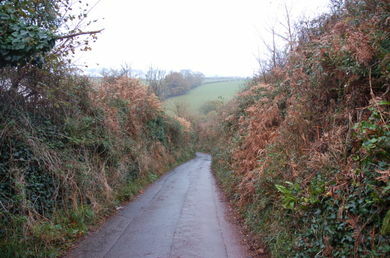 I also drive the 5 minutes or so through the lanes praying loudly that I wont meet another car because there are no passing places and reversing for half a mile is not something I can do very well, to say the least! So most mornings I choose to sit bumper to bumper...taking 15 minutes to drive 2 miles, in the not-so-scenic route. We live as you probably remember, in a ugly seaside town..and have this beautiful countryside so close, though, it often goes unnoticed. The photos were taken in 'rush' hour and less than half a mile away the queues of traffic were built up for miles. So no, unfortunately I do not live in a beautiful cottage surrounded by country lanes...but I am believing for it and I'll let you know when it happens! You must excuse an emotional post but I can't stop the tears from falling from my eyes as I look over these photographs that I took today. 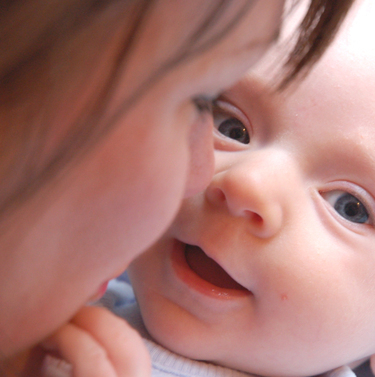 I have had a visit from my lovely friend Justine and her beautiful new son Joshua. Isn't he just the best thing you've seen today? He very kindly put up with me clicking away and I must have taken nearly 150 pictures! Justine was positively glowing with love for her beautiful boy and when I came to edit these pictures I was overwhelmed with emotion. Yes, Jus, it is your time now, and I couldn't be more happier for you and Mike. 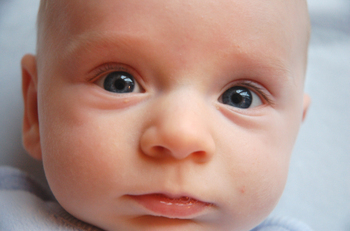 I'm so happy that it is me taking photos of your precious son as you have done with all of mine. You deserve this..Joshua is fortunate to have such a wonderful mother. Enjoy! Aww..this photo looks blurry..but blurry or not, it brings such excitement to my heart. This is the picture I wait all year for - the Christmas editions! Some are good..some a little disappointing ..some I have yet to open. 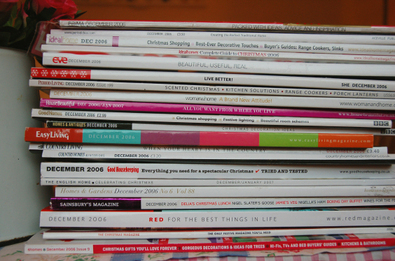 I'm strict as usually I have to finish one before I even look at another but that has posed problems in the past because I found that come January I still had some to read and what could be bleaker and more depressing than reading a Christmas magazine just after you've packed everything away? I always feel very blue in January so this time I have sped up the process and have flicked through most already. And for your pleasure here is the greatest! ..it arrived on Saturday morning and Anth didn't think to wake me! It's good but I can't say it is the best one. Actually my favourite this year is a free little book that came with Good Homes. It is full of the pictures from the 2 books I bought - Christmas Details and Creating your perfect Christmas. I did want to share this poem with you - I really love what it means and I have it stuck on my fridge to try and remind me what sort of Mummy I should be..and guess what? I got it from a magazine! I've been doing quite a bit of shopping recently, big and little. I've been spending too long on e-bay treasure hunting but have found a new passion...old Tuck postcards. There is something about their cute, peachy,cherubic faces and the lovely colours that make me never want to stop gazing at them. 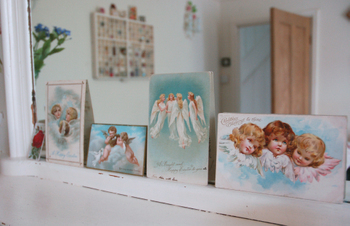 It's not just angels I like as the old Christmas postcards are just as beautiful but I have them hidden away until I decorate the house. 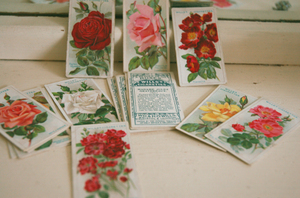 Whilst I was hunting I came across these..
..they are cigarette cards and are very cheap to buy. There are various 'collections' but the floral ones are obviously my favourite. Even the print on the back is beautiful! I have these dotted around the house, in my printers' trays etc, and the rest I keep held together with a sparkly clip earring. Now, on to family news.. 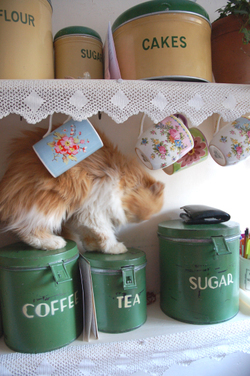 I walked into the kitchen and happened to glance to my left - he had somehow managed to jump onto our shelf..nearly knocking off my mugs in the process! His tummy was better for 2 days..but this afternoon it started all over again and I have just come back from the vet. This time I have to keep him longer on the boiled chicken..sigh..when will it ever end I wonder!? He and Posy are very sweet together. He runs and chases her, wanting to play, but she rarely joins in preferring to watch in a more lady-like fashion. Today Anth got reading glasses!! It's official - he is turning into an old man. I can see the odd grey hair too..he might agree to a photo of himself in his new glasses so watch this space! Alice auditioned for a part in Grease for her school..we are still waiting to hear if she was successful. Lucy is stressing over her coursework..her Grammar school really does work them hard and some of the work she is doing at 14 is stuff that 18 year olds do. It is all beyond me! Tom is also finding the work at sixth form harder so getting a slot on the computer these days is quite hard! I'm a day late in posting but I do have a very good excuse - more of that later on. First, I would like to show you my week's work. Yes, it does seem to take me ages to actually finish something, and yes, I so yearn to be like some wonderful bloggers who seem to start and finish many things in an evening! Well this time I'm actually very pleased with how these have turned out..you see I finally learned how to sew narrow lace evenly onto a cushion! It has always been a rather hit and miss affair as I would sandwich it in between and hope for the best. Now I know that you sew it onto one side and then use that stitching as a guide for when you put it all together! How dumb have I been all these years? 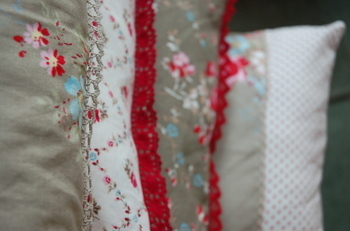 It was only after very careful studying of another bought cushion that I realised what to do! Yay! They look just as 'good' as bought ones. Again, they were made from Green Gate tea towels and a napkin. Lucy told me that you would all think I was crazy because, .."you always use the same pattern. How boring!" Umm isn't all the same pattern and it is a totally different colour! Maybe you do think I'm weird but I still love them especially the brown winter colours which tone so well with this..
..oh the bliss. Now not all has been bliss in our household. Alfie has been and still is poorly. He has, to put it nicely, a bad tummy which has had me cleaning 'it' up every 2 hours since Saturday. I took him to the vet yesterday and we left with some antibiotics (and I was nursing a scratch) and joined Anth and his work colleague in the car to drive the lady home when he promptly decided to poop all over himself in his cat carrier. The smell made us turn around and I was rapidly dropped at home with one smelly cat dreading to open the carrier to see what faced me! He has been staved but still isn't better. I'm hoping the medicine will kick in soon. It's not all doom and gloom. Look at them now! It didn't take long for Posy to stop hissing but I think she is quite shocked by his behaviour as I popped into town for 25 minutes this morning and came back to discover that Alfie had jumped from the ironing board ( not put away!) onto our mantlepiece and smashed the green candlestick I bought in the summer..and it was my favourite. She also witnessed him singeing his fur and whiskers on the hob! If this is what he's like when he is poorly I feel we have alot in store in the coming months and years! I can't say I wasn't warned!